Optic nerve sheath meningiomas (ONSM) account for 2% of all orbital tumours1. They are the second most common optic nerve tumour after gliomas and represents 1-2% of all meningniomas2, 3. Without treatment, continued growth of ONSMs result in progressive loss of visual acuity, colour blindness and eventually complete loss of vision1. Tumour-related mortality has been reported to be 0%3. Radiological findings are usually of an enlarged optic canal, optic nerve thickening and enhancement and calcification within the tumour2. Definitive treatment of ONSM is controversial. Fractionated radiotherapy is often the first choice in an attempt to control the ONSM growth rate and to preserve vision if the diagnosis is not in question3. Surgery remains best-treatment in cases with blindness, severe proptosis and in patients with intracranial extension3. A 57-year old female GP presented with a 1-year history of blurred vision and visual field changes in her left eye. She had a history of a pituitary adenoma 30 years previously, treated by open craniotomy and post-operative radiotherapy. She was otherwise well. Examination revealed visual acuity of 6/5 on the right and 6/36 on the left. There was left relative afferent pupillary defect and left-sided brightness desaturation. No proptosis was noted and the patient had a full range of extraocular movements. Anterior segment examination was unremarkable, while fundal examination showed disc pallor of the left optic nerve head without disc swelling. There was progression of inferior visual field loss (Humphrey visual field test) between January 2010 and February 2011. An MRI scan of the brain and orbits was performed (Figure 1), which showed an elongating gadolinium enhancing band-like area adjacent to the superomedial aspect of the left optic nerve sheath measuring 13.4 x 3.5mm, compressing and displacing the optic nerve inferolaterally. The mass extended posteriorly to the level of the optic foramen. A cerebral angiogram was performed, which did not show a carotid cavernous fistula or aneurysms. Figure 1: MRI of the ONSM. Note the elongating gadolinium enhancing band-like area adjacent to the superomedial aspect of the left optic nerve sheath compressing and displacing the optic nerve inferolaterally. 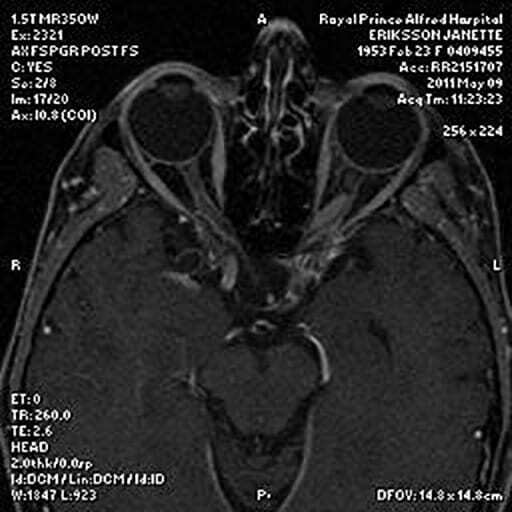 The differential diagnosis was an ONSM, a diffuse glioma of the optic nerve, or less likely, an atypical recurrence of pituitary adenoma. 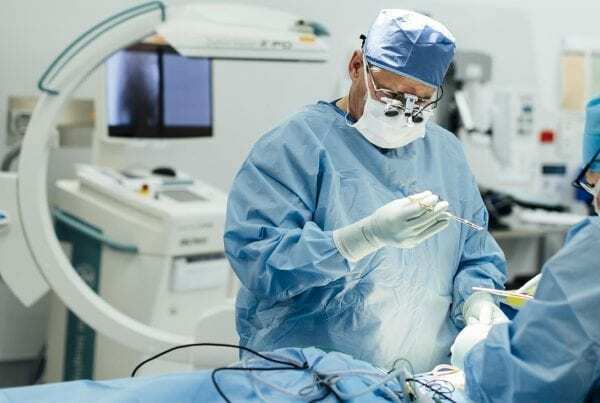 With her symptoms progressing and the uncertainty of the diagnosis, the patient expressed a strong preference for surgical exploration and removal of the lesion with division of the optic nerve. 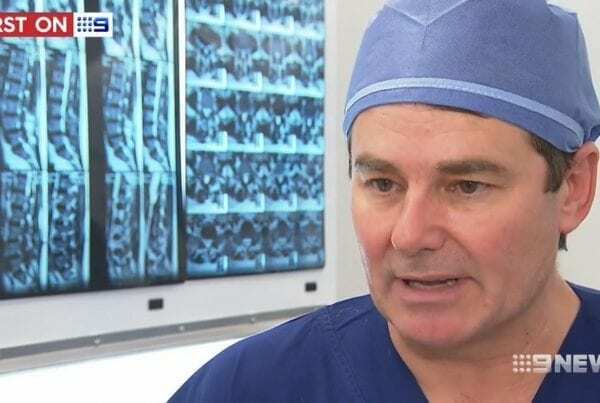 A stereotactically guided resection of tumour was performed through an orbitozygomatic craniotomy. The left frontal lobe was gently retracted to expose the superior orbit. The roof of the orbit was decompressed to 6mm anterior to the optic canal. After opening the periorbita and exposing the muscle cone, the supraorbital nerve was mobilised laterally. The optic nerve was localised behind the globe and the optic nerve was full inside the dura. A band-like structure was not identified, instead a macrospically normal-looking nerve was found surrounded by soft red/brown material. Resection of the optic nerve over a 16mm distance was performed and sent for histopathology. 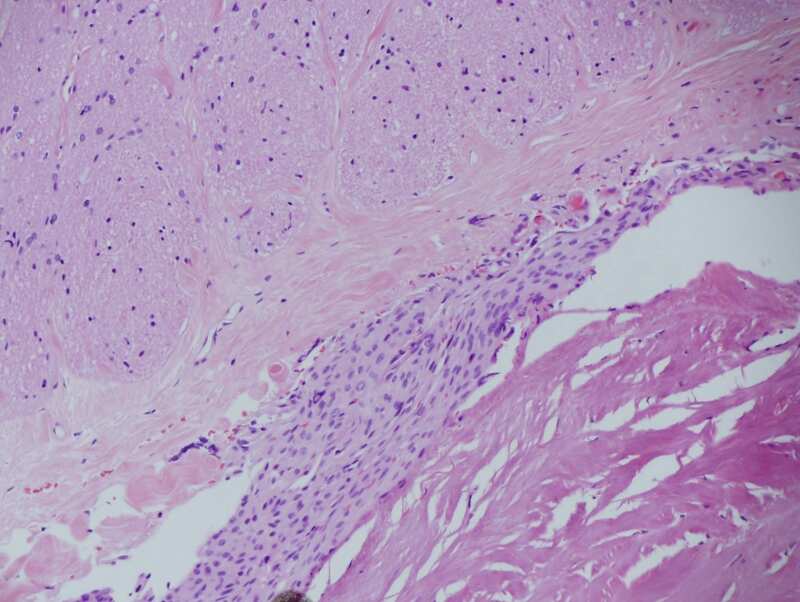 Histopathology (Figure 2) showed fibrous thickening of the dura and arachnoid around the nerve with large collections of meningiothelial cells between the two layers, consistent with an ONSM. No invasion of the optic nerve was noted. No subdural involvement of the meningioma was seen at either end of the nerve segment. Thus far, the patient has been followed up over a 6 month period and is recovering well. Figure 2: Histological appearance of the ONSM. The meningothelial cells do not invade the pial/arachnoid tissue. Our case demonstrated unusual radiological features of a histologically confirmed ONSM. The largest case series on record of ONSM describes five radiological patterns commonly encountered2. The commonest pattern identified was tubular (62% of cases), with subgroups of diffuse (45%), apical expansion (15%) and anterior expansion (3%), which had minimal widening of the optic nerve and more frequent evidence of calcification2. The second group was globular tumours (23%) where growth was outside the dural sheath causing significant proptosis. 11% displayed a fusiform pattern and 4% had a focal enlargement of the optic nerve2. The radiological appearance of the ONSM in our case did not conform to any of the known patterns; rather, it appeared as a distinct band-like structure that displaced the optic nerve. Cannalicular ONSM can often pose a diagnostic challenge for clinicians as very small lesions can compress the optic nerve and cause significant and progressive visual symptoms because expansion is limited by the bony canal walls. Reports have shown diagnostic delays of greater than 1 year due to this variability in radiological appearance4. It is strongly recommended that all cases of progressive visual loss be investigated by high-spatial-resolution MR of the orbit before and after contrast enhancement in combination with fat suppression4, 5. Recent literature reviews support the safety of fractionated radiotherapy in the treatment of ONSM2, 3. Wright J, McNab A, McDonald W. Primary optic nerve sheath meningioma. Br J Ophthalmol. 1989;73:7. Saeed P, Rootman J, Nugent R. Optic nerve sheath meningiomas. Ophthalmology. 2003;110:12. Pacelli R, Cella L, Conson M, Tranfa F, Strianese D, Liuzzi R, et al. Fractionated Stereotactic Radiation Therapy for Orbital Optic Never Sheath Meningioma – a Single Institution Experience and a Short Review of the Literature. J Radiat Res. 2011;52:6. Jackson A, Patankat T, Laitt RD. 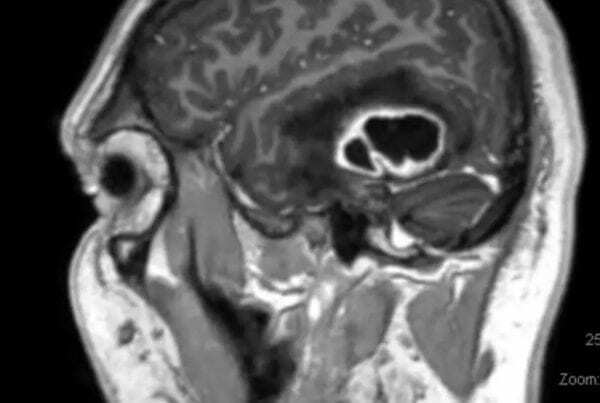 Intracanalicular Optic Nerve Meningioma: A Serious Diagnostic Pitfall. Am J Neuroradiol. 2003;24(6):1167-70.